Property managers already have a ton of work to do when changing over to new tenants. Why deal with the hassle of all the left behind junk and unwanted items? Most renters don’t leave the home or apartment spotlessly clean when they move out. Junk, old furniture, mattresses, and anything else your tenants didn’t want to take with them got left behind and now it’s up to the property manager to deal with all the trash hauling in Springfield Missouri. That’s where Dog Gone Junk comes in. We can make your apartment, house, duplex, triplex, townhouse, and any other leased property ready to be rented again in no time. We can remove all unwanted items from old appliances and furniture to trash left behind in a bedroom. We will make all the unwanted stuff disappear in a fast, efficient manner, so you can deal with the more important task of getting a new tenant in there. Let Dog Gone Junk do the heavy lifting. We are trained and experienced in getting bulky, heavy items out of apartments, down long hallways, and down any number of flights of stairs. We can clear out entire apartments or homes quickly and most importantly, at affordable rates. We pride ourselves on always leaving a place cleaner than how we found it. We also take great pride in donating or recycling as many items as possible from all of our property cleanouts. Every day your property sits with unwanted junk or furniture inside of it is another day that you aren’t able to collect rent from a new tenant. 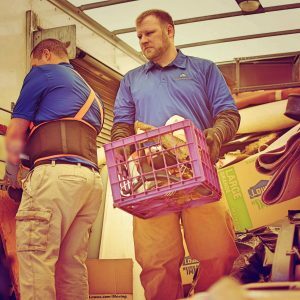 Make your life easier as a property manager by using Dog Gone Junk as your go to property cleanout professionals. Affordable, quick, and professional, we can remove any items other than hazardous chemicals or waste and you can get a new tenant back in your property as soon as possible.